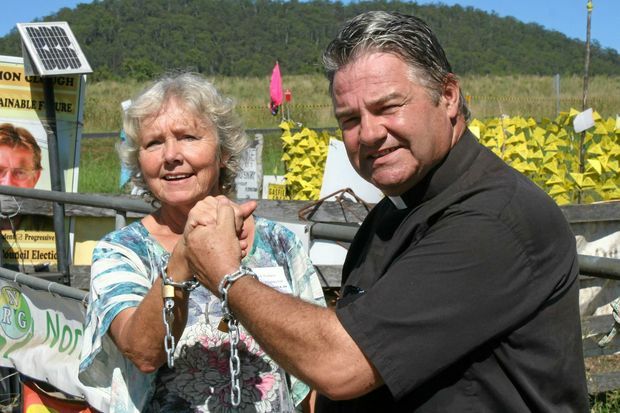 LOCK DOWN: Bentley farmer Meg Nielsen and Kyogle Reverend Jim Nightingale, could have been forcibly removed and arrested and their “lock ons” seized at the Bentley blockade under a new bill proposed by NSW government. By Melissa Gulbin. Reprinted from the Northern Star, 10th Mar 2016. A RAMPED-UP anti-protest bill proposed by the Baird government this week could see the forcible removal and mass arrests of Knitting Nannas and the seizure of bike locks – even tractors – under mere suspicion they could be used as lock-on devices by coal seam gas opponents. Under the Inclosed Lands, Crimes and Law Enforcement Legislation Amendment (Interference) Bill 2016 put to parliament this week, peaceful protesters would face a tenfold increase in the maximum penalty for statutory trespass -from $550 to $5500. This amendment of ‘aggravated unlawful entry’, applies not only to mining or petroleum operations but to any site upon which any business or undertaking is conducted. The bill has been proposed during a critical flashpoint at the Pilliga near Narrabri, between anti-CSG protesters and mining giant Santos – which donated close to $170,000 to both major political parties in the 2014-15 financial year. Resources minister Anthony Roberts said the reforms would enable police to take a more proactive approach to managing and prosecuting illegal activity, which he said were tying up police resources. Mr Roberts said, “Unlawful activities put the safety of protesters and workers at risk and are costly for businesses and the public. However, Walt Secord, shadow minister of The North Coast, said these laws would have been used to remove the peaceful protesters at Bentley on the North Coast. He said Labor would resolve its formal position once the legislation was tabled, but he was worried about the language, tone and direction being set by the Baird Government. Mr Secord said Energy Minister Anthony Roberts’ use of the language like “eco-fascists” – was counter to sensitive community debate and discussion on exploration in NSW. Far from protecting the safety of workers and protesters, Activist and SCU law lecturer Aidan Ricketts, said “In the absence of lock-on devices there is a risk of escalation. People may feel the need to resist bodily. That’s what lock-ons avoid. “The use of lock-ons at Doubtful Creek and potentially Bentley were the very thing that enabled people to peacefully attend protests as bystanders. “Under the proposed bill, lock-on devices such as bike locks, can be seized under mere suspicion that they might be used. “A new provision provides for a power to seize private property on the basis of suspected future intended use. It is possible that it could even extend to tractors or other agricultural machinery if police suspected these were intended to be used as part of a lock-on installation,” Mr Ricketts said. “If your tractor was seized because it was a lock on, you can’t even go to court and get it back,” he said. Mr Ricketts said lock-on devices are a time-honoured last line of defence for peaceful protest, from the Suffragettes forward, and that they actually keep protests calm and safe. Metgasco investor John Vaughan downplayed the effect that the new laws would have had on the Bentley Blockade. “It would not have made a big difference the way it all worked out, but one can understand the tightening of the law as a reasonable response to protests which damage and disrupt lawful business,” he said. NSW Labor Luke Foley, who proudly donned the Knitting Nannas’ yellow and black beanie for the cameras during his Bentley Blockade election campaign visit, was specifically concerned for our nannas. He said in response to Anthony Roberts bill, “It’s ludicrous that the Minister won’t protect a group of seniors who are simply expressing their concerns about the impacts of CSG mining.” he said. Mr Ricketts said the bill was a clear overreach of power. “It elevates business premises above other private premises by providing a much higher penalty for trespass and interference. 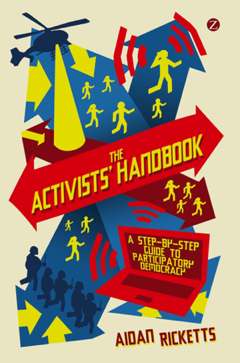 This approach mirrors the approach taken in anti-protest laws in Western Australia and Tasmania recently, in which interference with business is asserted as a justification for imposing exceptionally heavy penalties for protest actions. WHILE the new bill proposes a tenfold increase for trespassing potesters who disrupt business, the Baird government have also proposed a downgrade of fines for miners. Penalties of just $5000 could be issued to a coal seam gas company which explores or mines without permission instead of a potential $1.1 million fine under changes introduced by the Baird government this week. Prospecting without authority -currently a $550,000 fine and $55,000 per day under a prosecution – may now be dealt with via a $5000 penalty notice.